Combine the lemon juice, olive oil, herbs, seasoning, and garlic. Sprinkle the chicken pieces with salt and pepper and brush the lemon mixture. 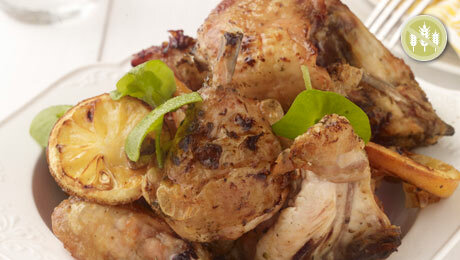 Place the chicken on a roasting pan and place in the oven for approximately 40 - 50 minutes, turning halfway through. When the chicken is thoroughly cooked, juices will run clear when pierced with a fork. Meanwhile place the carrots in a small pan with the butter, caster sugar and enough stock or water to just cover the carrots. Bring to the boil, then cook over a moderate to high heat for about 12 minutes until the carrots are tender and all of the liquid has evaporated. Shake the pan occasionally to prevent sticking. Serve the chicken with the vichy carrots and some garden salad. This chicken was great! I mixed all of the spices, olive oil and lemmon juice and rubbed it under the skin of the chicken and then over the top of the skin and poured the remainder in the cavity. I put about 3/4 cup water in the bottom of the pan and baked the chicken upsidedown with the breasts in the juices. I covered the whole thing in foil and in 2 hours the flavorful meat was falling off the bones. My company raved and everyone ate way too much. Served with baked apples, green beans and fresh bread. Delicious!